Instant odor annihilator PLUS encapsulation detergent. How does Encap-A-Cide remove odor? First of all, it DOES NOT work by masking or covering up odor. It IS NOT an antimicrobial or sanitizer. It DOES NOT use oxidizers or troublesome, slow acting enzymes. The advanced odor removal technology used by Encap-A-Cide is both complex and amazing. Through absorption, encapsulation & chemical fixation, most odors are instantly neutralized completely or greatly reduced upon contact. What kind of odor does Encap-A-Cide remove? This amazing product removes obnoxious odors such as those caused by pet urine, skunk spray, vomit, mold & mildew, feces, organic & protein decay. It is very effective on odors associated with death such as cadaverine (a dead mouse is an example). It works to remove odors caused by smoke, putrefaction, doggie odor, etc., etc., etc. Besides removing odor what other qualities does Encap-A-Cide have? In addition to removing odor, Encap-A-Cide is a powerful film forming encapsulation detergent which contains excess brittle drying polymer. Unlike competitive products, it will not leave a sticky dirt attracting residue. It dries completely non-sticky, and actually helps dry up and remove sticky substances that may be present in the carpet and helps to insure that the carpet will stay cleaner longer. 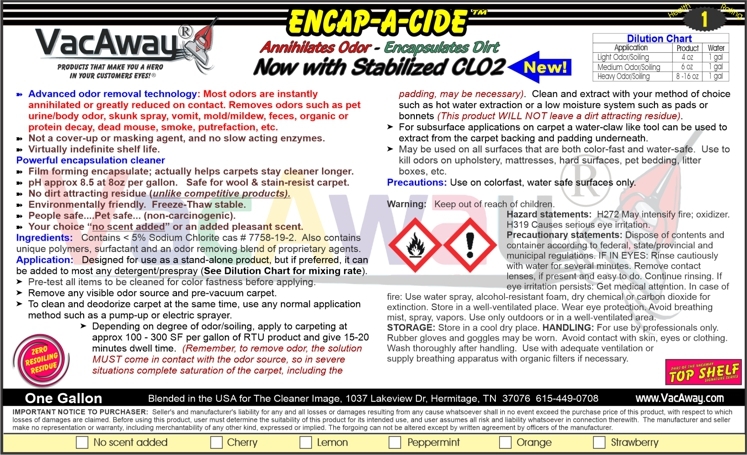 In summary, Encap-A-Cide is a very unique, dual purpose product. It kills most odor on contact PLUS it doubles as a film forming encapsulation detergent, thus it will save you both time and money! From Anonymous of Kansas City, Missouri on 2/28/2018 . Used this product to pre treat-spot treat dog urine on a cream colored polyester carpet in a hallway. Followed pre tx with a complete shampoo and hot water extraction machine. Used fans to speed dry carpet. After dry, the treated spots had a brown stain like browning. I repeated shampoo with a low ph shampoo and again speed dried carpet. The brown staining reappeared after carpet dried. This product completely neutralized the smell all the way into the padding, but cause the treated spots to brown. I finally went over the spots by hand using a surface cleaner and a white cloth and lifted the brown staining which appeared to be on the surface of the carpeting. I love this product for removing all odor in the carpet, but am puzzled as to why I get the brownish residue on the stain after it is dry. ANSWER FROM VACAWAY: The product will not cause staining or browning. The browning is caused by the carpet wicking moisture and dirt from underneath as it dries.